Tuesday morning, The Hutchinson (Kansas) City Council continues its consideration of a proposal to move the city hall offices into the nearly century-old Wiley Building, itself a magnet of controversy due to allegations of poor maintenance and the fact of an overdue tax bill. The proposed move could involve eminent domain and opinions are passionate both pro and con. 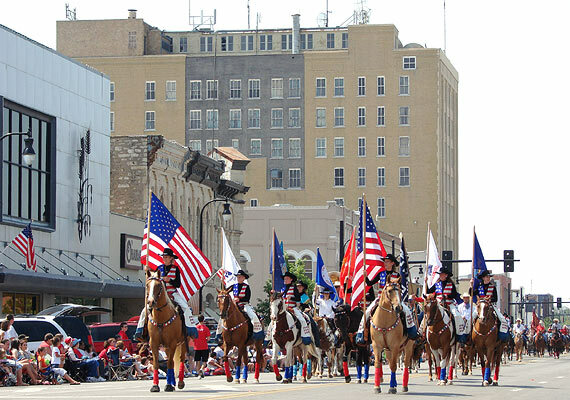 The latest summery of the matter can be found in this article from the July 2 Hutchinson News. To learn about the history of the Wiley, I went where all the cool kids go - to the Hutchinson Public Library. In their Kansas Room, I perused the Hutchinson Historic Resources Inventory - Downtown, a 1990 publication compiled mainly by Pat Mitchell and Linda Laird, from which the historical data for this blog post is paraphrased. First off, its original name was actually the Rorabaugh-Wiley Building. Partners A. O. Rorabaugh and Vernon M. Wiley wanted a larger building for the dry goods business they'd operated in nearby locations since 1901. It was apparently Wiley who spearheaded the construction of the current building, despite reluctance from bankers to loan the $350,000 for the project. Eventually, someone at the Chase Manhattan bank told him "Mr. Wiley, if you have the nerve to build an 8-story skyscraper in the middle of the prairie, in a town of less than 20,000, we have nerve enough to lend you the money." 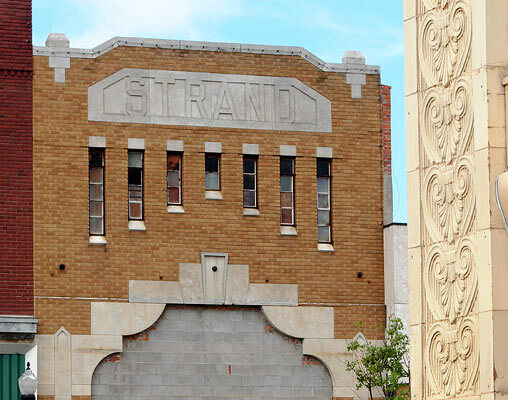 History eats older history sometimes, and Hutchinson's original opera house was razed for construction of the Wiley-Rorabaugh, which began in September of 1912. By late 1913, Rorabaugh and Wiley's dry goods business occupied the first four floors, with the top four floors rented as offices. 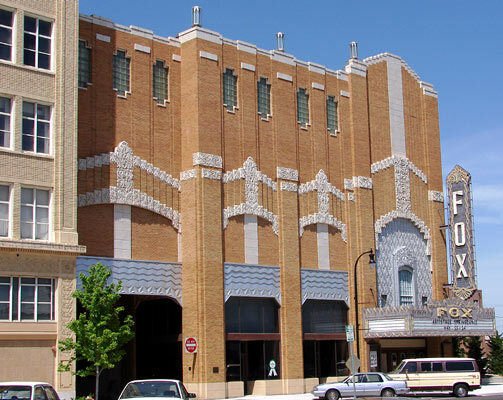 The Fox Theatre and the bridge connecting it to the Rorabaugh-Wiley building were constructed in 1930-31 by the Wiley investment company. The name Rorabaugh was dropped in 1933. 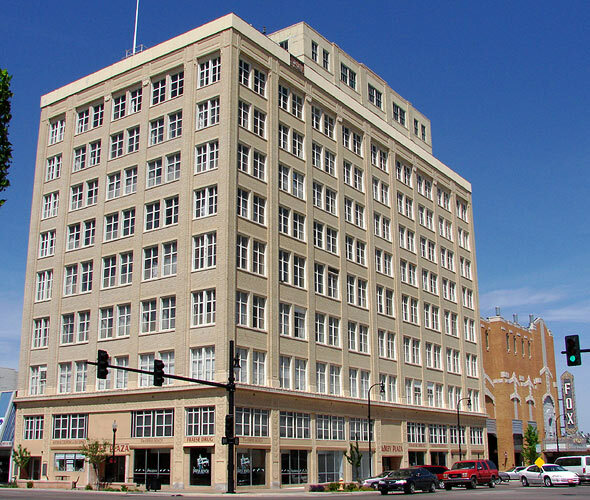 A ninth floor penthouse was added in 1937 to house the Kansas State Grain Inspection. You can see it atop the building in the distance. I could have cropped the picture to show just the penthouse, but buildings do not exist in a vacuum, so I am choosing to show it in context with the life of the city around it. Another expansion occurred in 1946-47 when two floors were added to the Fox and to the bridge connecting the two buildings. Remodelling may have occurred on the west and south entrances and new fixtures may have been added. Another addition occurred in 1959, which may have involved filling a gap in the north side of the building. 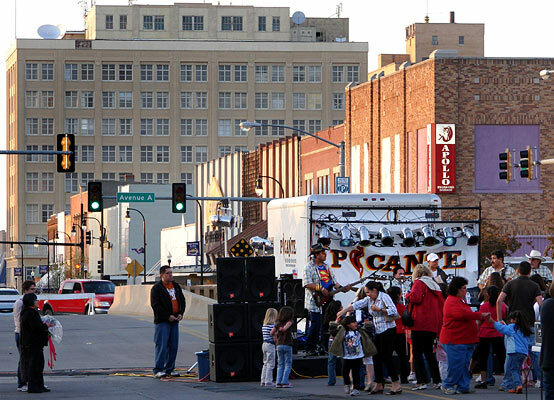 Perhaps this accounts for the differing brick in the middle of the north side, seen here in the background of Hutchinson's July 4, 2008 Patriots Parade. 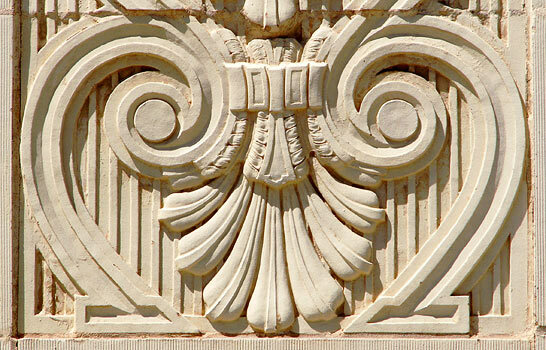 The Hutchinson Historic Resources Inventory mentions that at this time a lighted cornice was removed, but doesn't mention if it was original or an addition. The Wiley Department Store had closed by 1990. The Wiley building has changed hands a few times and is now owned by George Nerhan, a resident of Arizona. 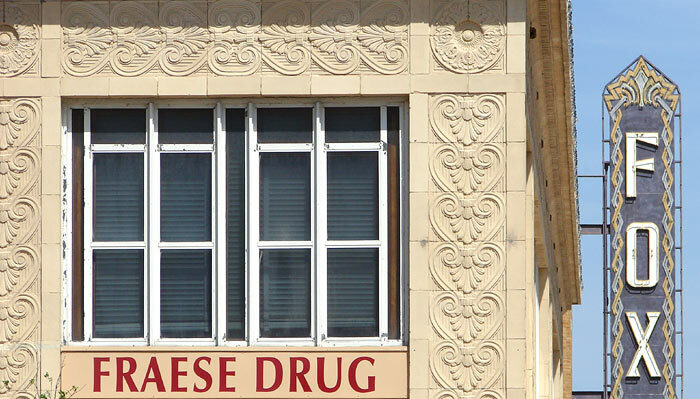 The first floor and mezzanine are currently rented to several businesses, the most well-known of which is Fraese Drug Store with its active restaurant and soda fountain. The once-closed and now restored Fox Theatre hosts movies, concerts and special events. Outside of the businesses in the first floor, not much of the Wiley is viewable by the public. 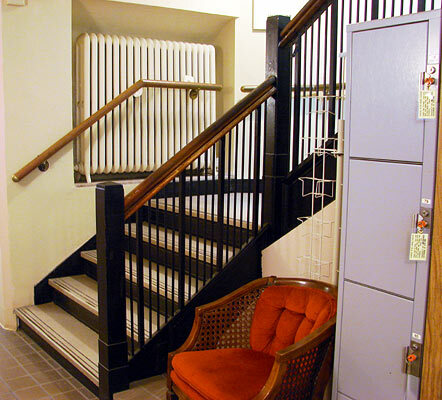 This is the staircase leading from the first floor. 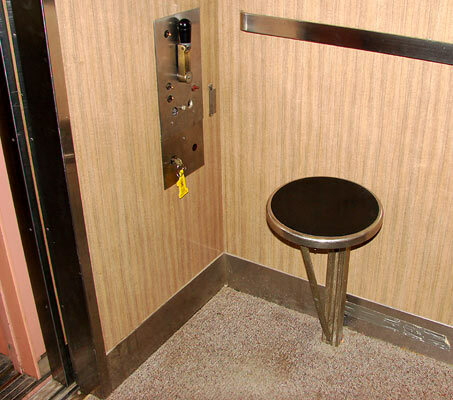 The elevator still has the seat used by an elevator operator. 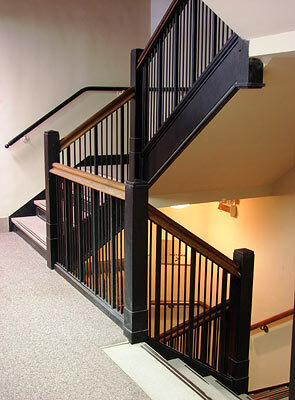 The stairs from the mezzanine level lead past signs warning of alarm. I hope to have a look upstairs; If I succeed, you'll see the results here. The older and newer skyscrapers of Hutchinson - the Wiley is reflected in the First National Bank building. Terra cotta corner of the Wiley, with the Strand Theatre building across Main Street. Thank you, nice pictures. Weird how you can still see the directory through the first floor windows which show businesses' names and room numbers for the Wiley Building which haven't conducted business there in years. My Grandfather had his his law practice in this building. I wish I knew more about his professional influence. Eugene "Gene" White. He passed in 1999. Thank you for this. I haven't lived I. Hutchinson for years but still remember all the times I went to Wiley's. I love the information while remembering the rides in the elevator and taking the stairs. In the early '80's worked for the owner of the Wiley building. I was born at Grace Hospital in 1929 and went to school in Hutchinson until the 2nd World War when my family moved to La. for my father to serve in the military. I remember shopping at Wiley's, loved the mezzanine and this certainly brought back memories to me. Thanks so much for publishing this.